For the past 6 months, I have based my blog on daily discussions within the company, and of course the ever-evolving market trends. When I recently found myself short on topics for the blog, and when I received a question from one of our customers that demanded a slightly more extensive discussion than the average response, it led me to believe that such questions and answers could be of interest to others. That, and since these more complex topics are well suited to the blog format, has given me access to an extensive source of ideas for a continuous blog, meaning that you’ll have to suffer my writing a while yet. In this blog post, we will be discussing the use of airborne LiDAR (Light Detection And Ranging) versus photogrammetry, and what we can expect from advances in sensors and post processing. What makes sense from a business perspective? As with all investments your choice should obviously be based on what makes sense for your business. At the end of the day it becomes a choice of technology based on the work that you are expected to perform, that and the budget available. To understand the correlation between available technology and your business need, it makes sense to educate yourself regarding the available technology, something I aim to help with. 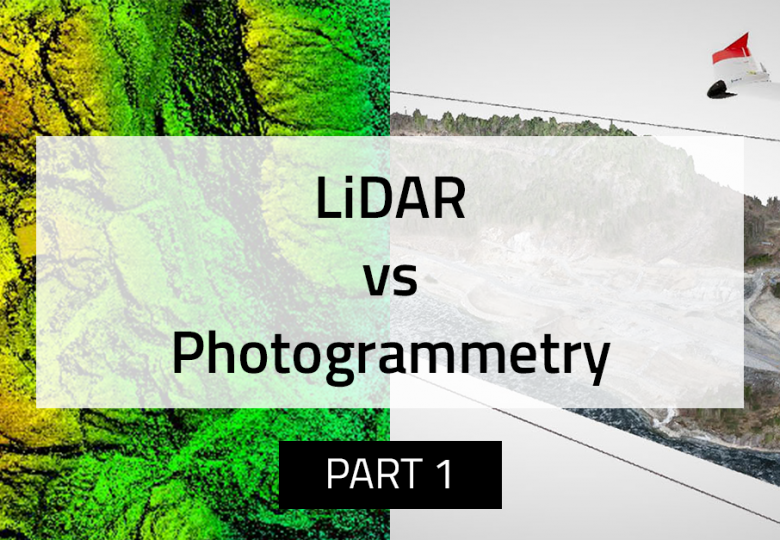 LiDAR vs. Photogrammetry – what’s the difference? When we are discussing LiDAR and Photogrammetry technologies, we are essentially talking about laser measurements and photographs. Photogrammetry use captured images to make measurements, while LiDAR use lasers to enable measurements. Lasers are distinguished from other light sources by their coherence. Spatial coherence is typically expressed through the output being a narrow beam, which is diffraction-limited. I.e. laser beams can be focused to very tiny spots, achieving a very high irradiance. LiDAR is a surveying method that measures distance to a target by illuminating that target with a pulsed laser light, and measuring the reflected pulses with a sensor. Differences in laser return times and wavelengths can then be used to make digital 3D-representations of the target. It also requires extremely accurate angle measurements to determine the direction of the laser beam. One of the advantages of LiDAR is the information that the sensor gathers, LiDAR scanners with multiple return capability are measuring more than a single point when a laser is reflected. This means we have multiple reflections that can for example represent both the surface of a tree canopy and then the ground, and even objects in between. Processing and modelling software allows the user to analyse specific areas and data of interest. For example, filtering the point cloud data to remove everything except the ground returns, resulting in a highly accurate Digital Terrain Model, DTM. Terrestrial Laser Systems are comprised of rapid pulse lasers, calibrated receivers, precision timing, high-speed micro controlled motors, precise mirrors and advanced computing capabilities. Along with precise angle measurement, echo digitization and waveform processing it is critical to measure time of flight accurately. There’s a higher point density and accuracy in terrestrial LiDAR than in airborne LiDAR. An Airborne LiDAR System is typically comprised of three major components, a LiDAR instrument, a GNSS receiver, and an Inertial Measurement Unit, IMU. The LiDAR instrument captures range information which is then combined with IMU and GPS data. Through post processing the result is a geo-referenced point cloud. The quality of the point cloud data produced by ALS depends on GPS and IMU accuracy, LiDAR ranging and angular accuracy, extended GPS base lines and SW post processing algorithms. Photogrammetry can only create points based on what the sensor of the camera can detect illuminated by ambient light. It involves estimating the 3-dimensional coordinates of points employing measurements made in two or more photographs taken from different positions. Common points are identified in each image, and a line of sight can be constructed from the camera position to the point on the object. It is the intersection of these lines that determines the 3D location of the point through triangulation. Furthermore, photogrammetry’s point cloud has a RGB values for each point. This means that you’ll have a colorized point cloud with good visual representation of textures. In the next part, we will continue the discussion around accuracy, pros & cons and use cases with regard to both technologies.